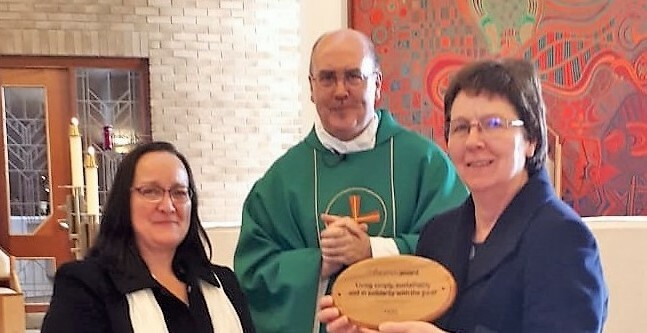 Successful completion of the programme leads to the Livesimply award, which is given to Catholic communities that can demonstrate they have taken significant steps to respond to the Church’s call “to live simply so that others may simply live.” The key criteria are living simply, living in solidarity with people in poverty and living sustainably with creation. With Monsignor Gerard Robinson’s approval, the Justice & Peace Group of St Mary’s Cathedral registered for the Livesimply programme in autumn 2017. Following CAFOD’s guidance, the group devised a wide-ranging action plan that included inviting Deacon David Cross to give a parish talk on Laudato Si’ and displaying selected quotations from thedocument on the Justice & Peace noticeboard. The strategy also included organising a family walk with refugees, encouraging parishioners to walk to church, promoting Fairtrade products, planting bulbs in the cathedral’s peace garden, supporting charitable causes at home and abroad through the “Ten pence bowl” and other fundraising events, organising food collections for the John Paul Centre and encouraging volunteer work through promotion of the World Day of the Poor. Some of these actions were on a large scale. For example, more than 70 refugees were welcomed to the family walk, which was followed by afternoon tea at the cathedral. Although organised by the Justice & Peace Group, the planned actions were successfully implemented only because of generous support from people throughout the parish, who have helped raise money to help the Padre Pio Rehabilitation Centre at Ahotokurom replace their existing old and unreliable bus, which often breaks down and is so small and uncomfortable that children and leprosy patients often have to stand or sit on each other’s knees. The bus is essential as it is the only transport for children and adults who attend the day centre, as well as many staff – see next month’s Voice for more on this important project. Joe Burns and Trish Sandbach, two CAFOD assessors from the Leeds Diocese, evaluated the action plan and granted the award to the cathedral, which becomes the first Livesimply parish in our diocese. So what are the advantages of taking part in a programme such as Livesimply? First, there is much to be said for drawing up a specific plan rather than working on an ad hoc basis. There is nothing like setting targets to provide the motivation to meet them. Second, the aims of Livesimply are wide-ranging, which means the individuals involved can find it an enriching experience by being taken out of their comfort zone. Finally, so many parishes do such good charitable work and Livesimply provides an opportunity to acknowledge formally what they do.